In a rural town in Portugal, granny notices Jack’s camera and holds up her grand-daughter to be memorialized on film, even though it’s unlikely she’ll ever see the photograph. 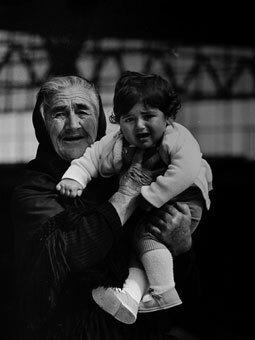 The chubby child twists in granny’s arms, asserting her freedom, but granny has a grip. A few minutes later, the youngster wriggles free and toggles down the road to greet another member of the family. The neighborhood is filled with relatives and friends who keep her safe from harm. With good will all around her, she learns her boundaries.